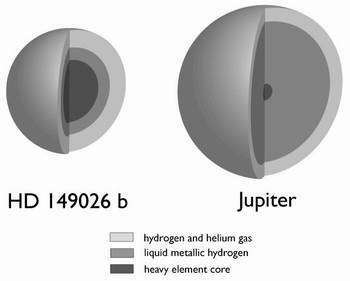 When a consortium of American, Japanese and Chilean astronomers first looked at this planet, they expected one similar to Jupiter. "None of our models predicted that nature could make a planet like the one we are studying," said Bun'ei Sato, consortium member and postdoctoral fellow at Okayama Astrophysical Observatory, Japan. This planet also passes in front of its star and dims the starlight. "When that happens, we are able to calculate the physical size of the planet, whether it has a solid core, and even what its atmosphere is like," said Debra Fischer. She is consortium team leader and professor of astronomy at San Francisco State University, Calif. The planet, orbiting the sun-like star HD 149026, is roughly equal in mass to Saturn, but it is significantly smaller in diameter. It takes just 2.87 days to circle its star, and the upper atmosphere temperature is approximately 2,000 degrees Fahrenheit. Modeling of the planet's structure shows it has a solid core approximately 70 times Earth's mass. In the "gravitational instability" theory, planets form during a rapid collapse of a dense cloud. With the "core accretion" theory, planets start as small rock-ice cores that grow as they gravitationally acquire additional mass. Scientists believe the large, rocky core of this planet could not have formed by cloud collapse. They think it must have grown a core first, and then acquired gas. Support for this research came from NASA, the National Astronomical Observatory of Japan and the National Science Foundation. A paper about this discovery was accepted for publication in the Astrophysical Journal.